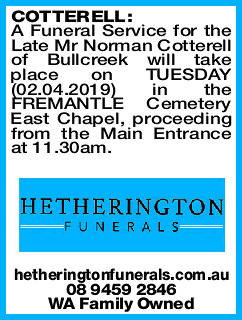 A Funeral Service for the Late Mr Norman Cotterell of Bullcreek will take place on TUESDAY (02.04.2019) in the FREMANTLE Cemetery East Chapel, proceeding from the Main Entrance at 11.30am. 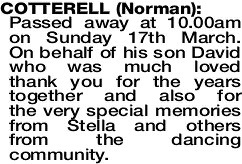 Passed away at 10.00am on Sunday 17th March. 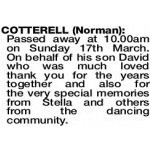 On behalf of his son David who was much loved thank you for the years together and also for the very special memories from Stella and others from the dancing community. COTTERELL NORMAN A Good Friend, Hard Worker, and an Excellent Dancer. 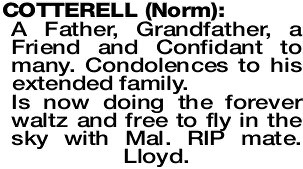 RIP Norm. A Father, Grandfather, a Friend and Confidant to many. Condolences to his extended family. 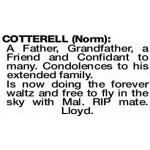 Is now doing the forever waltz and free to fly in the sky with Mal. RIP mate. Lloyd.